Champa Shashti 2019 date - Mantra - How To Do Champa Shashti Puja? Champa Shashti is a festival observed on the sixth day during the waxing phase of moon in the Margashirsh month. The festival is dedicated to Lord Shiva. Champa Shashti 2019 date is December 2. The day is of great significance in Maharashtra especially at Khandoba Temple at Jejuri near Pune. The temple is dedicated to Martand also known as Malhari or Khandoba or Khanderao. Lord Shiva took the form of Martand to destroy two demons named Mani and Malla. Sasti, or Shashthi, is the sixth day in a lunar fortnight in Hindu calendar and is mainly dedicated to Lord Muruga or Subrahmanya. Legend has it that two demons named Mani and Malla became powerful by performing intense Tapas (austerities) dedicated to Brahma. After several years Brahma gave them boons. With unimaginable power at their disposal, Mani and Malla started harassing demigods and humans. They created havoc and disturbed the peaceful life on earth and heaven. Manichurna Mountain the abode of several Saints was taken over by the demons. Rishis and demigods approached Shiva. Shiva brought out several lieutenants from his matted lock to fight Mani and Malla and went to Manichurna Mountain. He himself took the form of Bhairav, the terrible form of Shiva and Parvati took the form of Mhalsa. 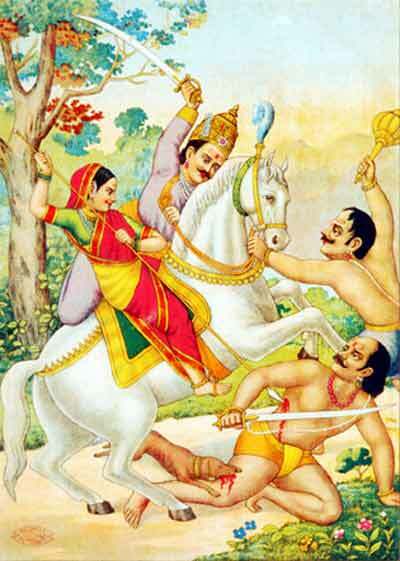 In some regions, Mhalsa is believed to be an incarnation of Mohini and Parvati. The battle began on the first day of Margashirsha. Mani and Malla fought hard for six days. Finally, they fell on the feet of Shiva and they were killed. This happened on the sixth day of Margashirsha and is observed as Chamba Shasti. It is believed Lord Shiva decided to stay here in the form of a Swayambhu lingam after defeating the demons. It should be chanted 108 times in a Shiva temple. How To Do Champa Shashti Puja? Lamp on the day should be lit using cow ghee. Ithar, abir, and other fragrance should be using in the puja. The main flower offering is red color rose. Bhog or prasad on the day should be made using sugar. Light nine lamps using til-ka-tel (sesame oil) to get relief from graha dosha in horoscope. Offer blue color dress or cloth to Kartikeya in a Shiva temple. Your stature in the society will improve. Donate brinjal and bajra to poor people on the day. You will get rid of enemy related problems.